This section of the site originally only described Kodak Ektars and the structure of the section still emphasizes that product line, as did Kodak publications. I have added information about other professional and advanced amateur lenses, though I've made no attempt to be comprehensive; for example, there is no information about entry level still cameras or Ciné cameras and lenses. The content and format for many pages in this section were derived directly from Kodak publications and my intention was and remains to give visitors a feel for the kinds of documentation about Kodak lenses that was available to users of Kodak optical products when they were produced. In this attempt at bibliographic correctness, site visitors may find navigation less than modern. The links below and internal page links attempt to bridge that gap. Additional information about Ektar lenses is available at the U.S. Patent and Trademark Office (USPTO). Instructions for access. 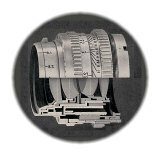 This booklet predates the first edition of the Kodak Reference Handbook and contains detailed information about many more lens models and considerable background information about Kodak lens design and production. Kodak issued replacement pages to registered owners of the original Kodak Reference Handbook which was published in a loose-leaf binder; the replacement pages contained updated information about new products and processes. Newer versions of the Handbook would have contained these pages. © dates in this material appear for 1940, 1942, 1943 and 1945 and perhaps other dates. One of the first separately bound Data Books was published in 1946 "For Revising Reference Handbooks," and noted as Second Printing.